Ahhh fall...quite possibly my favorite season! I get giddy with excitement thinking about fall flavors, recipe combinations, and pumpkin patches sprinkled across the country roads. This recipe allowed me to channel my excitement for the season. Pomegranates have always been a marker of fall bounty, but more recently became my own, more meaningful symbol of strength, hope, and life. The fires that ravaged our picturesque wine country just a few short weeks ago turned autumn-hued hillsides into canvases of black-and-white. As I was driving through a particularly fire-scorched hill, where the flames and heat had taken out cars, melted plastic garbage cans, and ripped through houses leaving only chimneys, and barns leaving only fallen corrugated metal roofs, I noticed a perfectly un-touched pomegranate tree right in the path of the fire. The bright crimson fruit popping against a newly colorless backdrop. And while I won't get into all that were the recent NorCal fires, I will say that, in that moment those pomegranates reminded me that there is always strength and beauty, even in times of destruction. I knew it would be Halloween, so...pumpkins! I also thought mint could be used in a dressing. A little internet searching brought me to a delicious, vegan mint pesto. And a trip to my boyfriend's parents house where they sent me home with a huge bag of pomegranates straight from the tree had me buzzing with fall salad excitement. Kale and some local Sonoma Laura Chenel Chèvre goat cheese seemed like natural additions. And my fall salad was born. I made it today for the first time and it got the Bauman College class' stamp of approval. The star in this recipe, like most salads, is not the salad itself, but what goes on it...the dressing! While there are only a few ingredients in the actual salad, the Vegan Mint Pesto takes it to another level of flavor. Combining the salty tanginess of the goat cheese, the little pops of sweetness from the pomegranate, with the more subtle and grounding flavors of the kale and pumpkin...and the result is too good not to share. Kale is extremely high in chlorophyll, which give plants their green color and gives us a multitude of benefits, from weight loss promotion, to accelerated healing of wounds, to improved efficiency of liver detoxification. Mint is a cooling digestive aid, soothing the stomach, and is helpful in the treatment of nausea and headaches. Mint is a natural stimulant, improving memory, increasing alertness, retention and cognitive function. It is also a great ingredient to aid in weight loss. Peppermint contains the compound, perillyl alcohol, which has been shown to inhibit cancer growth and cancer cell formation. It also contains a substance called rosmarinic acid, which blocks the production of allergy producing leukotrienes. Pomegranates are packed with 3X the antioxidants of red wine or green tea, have anti-tumor and anti-viral properties, reduce dental plaque and protect against oral diseases, and promote healthy blood circulation (aka giving you glowing skin!). Pumpkins are a super source of vitamins A, E, B vitamins, copper, iron, folate, and magnesium, boosting our bone mineral density. They are high in fiber, and have been shown to improve vision, increase fertility, boost immunity, and even protect us against cancer. Pumpkin seeds are protein-packed powerhouses of zinc, phosphorus, and manganese. Naturopathic doctors have used pumpkin seeds to treat prostate conditions effectively. Fall Pumpkin Salad with Vegan Mint "Pesto"
Preheat oven to 425 degrees F. Lightly coat pumpkin cubes in avocado oil. Roast pumpkin for 30 minutes, stirring and flipping half-way through. Cubes should be browning on sides and cooked through. Remove from oven. Lightly dust with sea salt, let cool. Prepare Vegan Mint Pesto and Pumpkin Seed Garnish separately (see recipes, below). Place kale in large serving bowl and add 1/2 cup Vegan Mint Pesto. Massage kale with sauce for several minutes to soften. Add pumpkin, pomegranate seeds, goat cheese, and additional Mint Pesto if desired. Sprinkle with Maldon Salt. Top with curry roasted pumpkin seeds. Preheat oven to 225 degrees F. Separate seeds from any pumpkin pulp, lay flat across baking sheet. Roast for one hour, stirring every 15-20 minutes. Increase to 250 degrees for the last ten minutes to get a nice toasty brown color. Roast until browned and crunchy. Exact time may vary depending on your oven. Drizzle lightly with avocado oil, then toss with curry powder and sea salt, to taste. Combine the mint, cashews, and garlic in a food processor and pulse until coarsely chopped. Add the oil and lemon juice, and process until fully incorporated and smooth. Add more olive oil if need be. Transfer to a jar, and store in the refrigerator. Make ahead: I roasted the pumpkin and the seeds a day ahead of time. They are easy, but take a little time in the oven, so I recommend planning ahead. You could easily make the pesto ahead also. 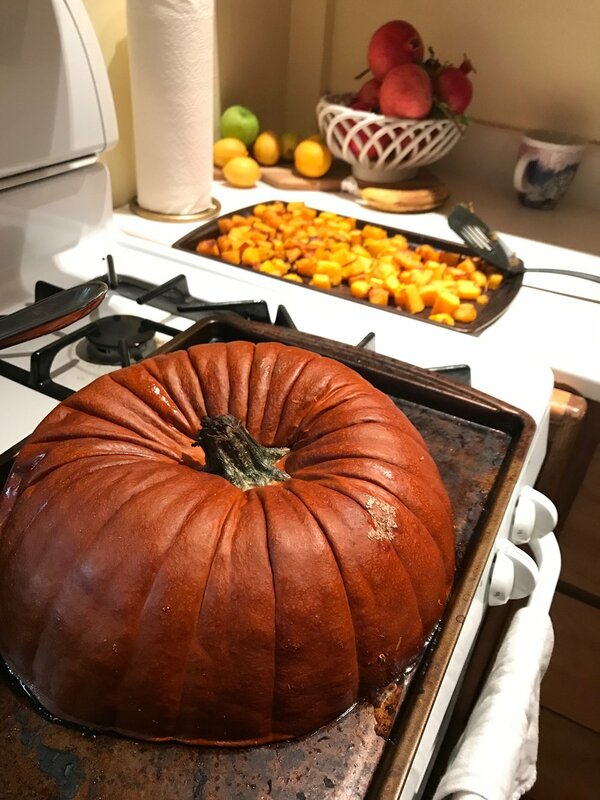 What to do with the extra pumpkin: I sliced the pumpkin in half, removed the pulp and seeds, roasted half in cubes and (after coating in avocado oil an sprinkling in salt) lay the other half directly on a baking sheet at 400 degrees F for 35 minutes. I then scooped it out - it came out like spaghetti squash so I put it into mason jars in the fridge and will add to salads. So yum! You could also use it to make a soup. Oils: temperatures are very important with oils. Oils have different 'smoke points,' aka maximum temps and if you go higher, they go from being a healthy fat to being unstable and toxic to your body. In this case, we are cooking the pumpkins above the safe temperature for olive oil, but avocado oil has a higher smoke point so it gets the green light! Save your nice olive oil for the unheated mint pesto! Vegan Mint Pesto: soak cashews overnight to make them more easily digestible and also get a creamier consistency. Soak smashed, peeled garlic cloves in olive oil overnight for extra delicious flavor! Get Creative: Plenty of room to play around with this recipe - butternut squash would be great in place of the pumpkin. Toasted hazelnuts or walnuts instead of the pumpkin seeds. Arugula would be a great green in place of the kale. using up the rest of a large pumpkin - roast it! It may be the last day for "Happy Halloween" wishes, but lucky for us, the pumpkin season has only just begun. Thank you for reading and be back soon!